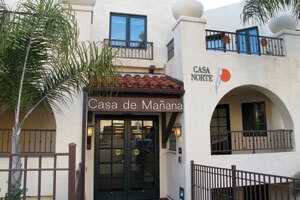 On a Sunday morning walk in La Jolla we passed by the Casa de Mañana Retirement Community on Coast Boulevard. To our surprise there was a wonderful rose garden. 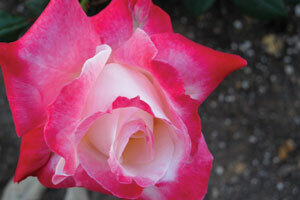 We were told that when new residents arrive they can pick a rose for the garden. 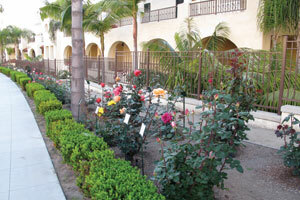 Casa de Mañana has two full-time gardeners so residents can enjoy the rosebush without the usual gardening chores. 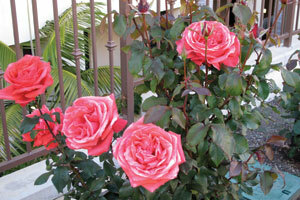 Friends of Casa de Mañana have set up a special fund to provide the rose bush at no charge to the residents. 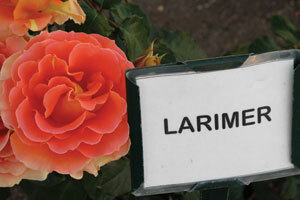 The roses are labeled with the name of the resident, not the variety of rose. 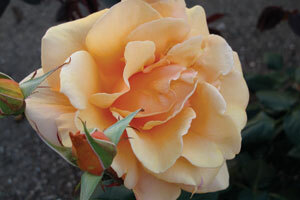 As a result, since I am an avid rose gardener, I tried to guess the variety. 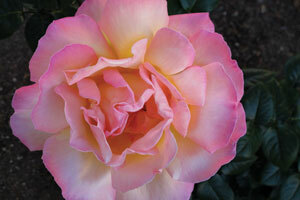 Since some of these roses have been in the ground a long time, the particular variety may not be available now. So let me know if I labeled any incorrectly at: editor@dreamvillager.com. San Diego always has flowers blooming and now we’re in the rose season. 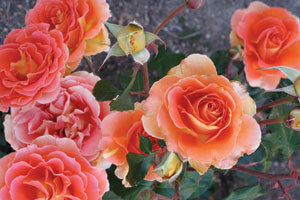 The San Diego Rose Society will be holding their annual rose show on May 12-13, 2012 (Saturday-Sunday) at the Scottish Rite Event Center in Mission Valley. Amateurs are welcome to enter. So get out and smell the roses! Memorial Day has enormous old-fashioned full flowers saturated with a strong, classic old rose fragrance. Brandy is a newer variety and extremely popular with its rich apricot petals. This Brandy rose bush is a prolific bloomer. Peace is the world’s most popular rose and a favorite of the residents. 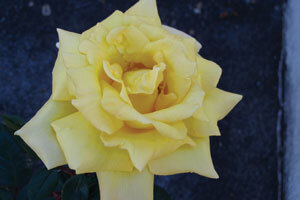 Yellow appears to be the favorite color of rose. This one is Mellow Yellow. 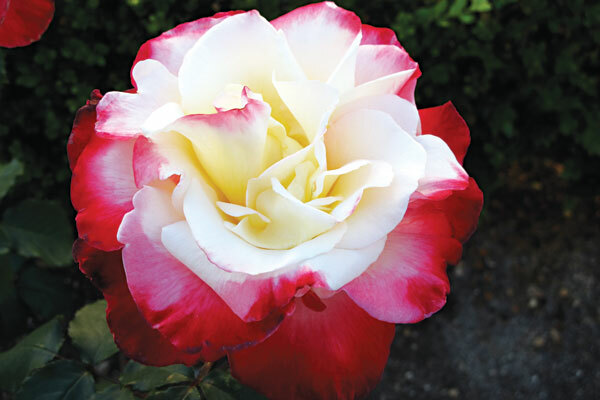 Double Delight is a very popular rose with a spicy perfume and big blooms of creamy white brushed with hot red. 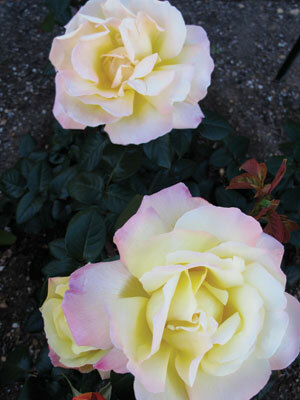 Each rose bush is identified by the name of a resident. This healthy bush may be We Salute You.